Isla Coronado on a calm day. Bahía San Juanico at dusk. Desert hills stretch to the interior of Baja. Desert cactus meets the sea. Fog layer at Bahía San Juanico drifts out to sea. Gringo beach homes line the shores at Playa El Burro. Playa El Burro is fringed with ex-pat beach houses. The Ancients saw the same striped fish we have. Pretty homes between tall palms on Playa Coyote. Bays within bays: Playa El Burro within Bahía Coyote within Bahía Concepcion. Easy living at Playa Santa Barbara. "Tents" for eco-tourists at Santa Barbara. Peace and tranquility at Isla Requesón in Bahía Concepción. Isla Requesón. Bahía Concepción's beaches and bays make the world slip away. flat calm water. The air was still as the sun slipped from the sky. too pretty to leave, if we could avoid it. but three of the boats had left for safety on the south side of the island, two miles away. from front to back, and the waves poured into the anchorage relentlessly. to watch the fierce action on our the bow as Groovy yanked the anchor chain this way and that like a wild beast. curled over and broke like the tunnel waves you see on TV surfing shows. get to smoother water. Once settled back on the hook we resumed our windy carnival ride under the mocking, blazing sun. 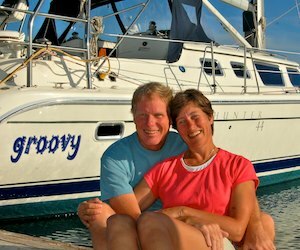 cruiser told us: "For every two days of paradise you get in the Sea of Cortez you have to pay with a third day of hell." together, letting us sleep in peace. Thursday or Monday? Was it noon or 4:00 pm? forced our eyes open. Naps came easily. little bit of guilt as he melted into delicious lethargy: "We wish we could build as good a rationalization every time we are lazy." mainland shore. The region is cherished by nature loving gringos who drive down from the north to camp on its calm shores. Palm thatched palapas offer shade for campers, RV parks offer hookups, and beach homes lie cheek-by-jowl along the sand. home is the one covered with antennas. We later met Geary in October, 2011.
lizard kept a close eye on us as we passed. Coyote saw Mark testing out their stripper's pole. locals that we got to know over the ensuing days. welcomed in as "los veleros," the sailboat people. from the Estrella del Mar bar were there, and we felt like one of the bunch. bars of Bahía Concepción operate on solar power and generators. completely. Nature became our entertainment. although we had not seen any yet. radar returns on our chartplotter like that of a small boat in the middle of the bay. for me to get a photo, and we never saw him again. splashing water -- like kids at a pool -- from pelicans diving all around us. pelicans. The days slowed down so much we noticed these things. ashore to talk to the fellow living there. transforms, trading its wildness for gentrified beauty, one beach at a time. exercise again two days later. our trailer and family and friends back home. Find Bahía Concepción, Playa El Burro, Playa Coyote, Playa Santa Barbara and Isla Requesón on Mexico Maps.